The Southland SRTT196E Rear-Tine Tiller is the best rear tine tiller for the value it provides. Are you looking to till your garden or seed your yard without breaking your back? Spring fever probably has you dreaming of a lush vegetable bed and newly sowed grass, but dense rocky soil is most likely standing in the way. Fortunately, rear-tine tillers offer an easy and convenient way to break through those inevitable tough patches and prep the land for easy cultivation. While these bulky machines are a bit intimidating, they’re really here to do all of the work. With that said, let’s take a look at the best rear tine tiller for your landscaping and gardening needs. What is a rear tine tiller? Do you need a rear tine tiller? A rear-tine tiller is a mechanical tool that is used to cultivate the earth for the growing season. It features rotating tines, or teeth, that dig into and loosen up the soil, helping to aerate it by breaking apart dense clumps. Most rear-tine tillers feature heavy-duty agricultural tires that enable them to traverse rocky, uneven, and/or muddy earth with ease. They feature a raised handle, motor, tines, and a drag stake. On top of that, most tillers can till in forward and reverse to handle varying land conditions. Cultivators are small front-tine tillers used for small gardens and raised beds. They feature small rotating tines that are great for breaking up already loose soil. 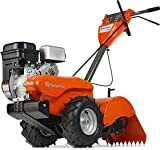 Front-tine tillers are push-behind machines used to cultivate small- to medium-sized yards and gardens. They feature an engine in the back and rotating tines in the front. Front tine tillers are usually less expensive and easier to operate than their rear-tine cousins. Rear-tine tillers are powerful push-behind land cultivators with tines in the back. They tend to be the strongest and most expensive type of tillers on the market. Wondering whether or not a rear-tine tiller is the right tool for you? A rear-tine tiller will save you loads of time and effort when compared to a hand tiller. Not to mention, it will enable you to break of dense sediment and rocks without the brute force of manual tools. On top of that, a rear-tine tiller’s counter rotating tines will use the resistance of the forward turning wheels to break through the new ground. A rear-tine tiller may even enable you to adjust your digging depth to enhance its performance in different types of soil. With large agricultural-grade wheels, you should have no trouble traversing rough patches when using a rear-tine tiller. Of course, if your land is more than 5,000 square feet, it’s really the only option to consider outside of a traditional tractor. There are few important things to consider before settling on a rear-tine tiller. Rear-tine tillers are naturally bulky. That’s because they are engineered to till large gardens, ranging from 5,000 to 10,000 square feet. With that said, tillers tend to feature a wide range of tilling widths and depths. We recommend choosing a tiller that is a good fit for your specific lot. If you’re planning on breaking new earth or want to work your way through coarse, rocky soil, then a tine depth as great as 11 inches may be necessary. Meanwhile, an adjustable tilling width that goes from 14 to 26 inches will enable you to work large areas quickly while managing tight touch ups between rows. Keep in mind that most rear-tine tillers weight between 150 and 200 pounds. While heavy machines offer more brute force, they are often difficult to control. Still, weight can be distributed strategically, providing better balance and control in slippery or adverse soil conditions. Rear-tine tillers are typically the longest land cultivating tools. Most tillers are about 6 feet long, 2 feet wide, and 4 feet high (including the handle). If you have a large muscular build, these bulky machines won’t be much of a hassle. However, if you are petite, it’s best to stick with a lightweight model with an adjustable handle height and reliable steering mechanisms. Rear-tine tillers have either plow or pistol grip handles. Plow handles, which look like the handlebars of a bike, enable one-handed operation. On the other hand, pistol grip handles require two-handed operation. No matter what type of grip you prefer, be sure to choose one with a wide range of adjustments. What’s more, ensure that it has a non-slip covering, such as textured rubber or foam. This will help prevent you from losing control of your tiller. Rear tine tillers are easily the most expensive land cultivators. Popular models sell for as much as several hundreds or even thousands of dollars. With that said, you can still find a solid rear-tine tiller on a budget. You may just have to go without a few premium features in order to hit that magic number you have in mind. Consumers often overlook the importance of a solid warranty. It’s a good indicator of a manufacturer’s involvement with their products. A generous guarantee ensures that you won’t have to foot the cost for any manufacturing or workmanship defects that might be slow to make their appearance. There are several indications of a high-quality tiller. Since rear-tine tillers are powered directly from the engine, it is important to check key performance factors. It’s also important to consider the type of materials used and the overall design. Keep in mind that most rear-tine tillers have a four-cycle engine, but the amount of power varies greatly depending on the model. Rear tine tillers may have standard- (forward), counter- (reverse), or dual-rotating tines. Some tillers may even rotate clockwise and counterclockwise, though this is not the norm. Keep in mind that standard-rotating tines work best in shallow, loose soil. Whereas, counter-rotating tines have enough force to break up dense, clay-rich, and rocky sections of earth. You can’t go wrong with a dual-rotating tiller, as it offers the best of both worlds. Rear tine tillers should feature large pneumatic tires with deep treads. A tiller’s tires should be engineered for harsh agricultural applications, meaning they can take a hit from a rock without blowing out. Tires should be at least 13-inches in diameter in order to handle harsh tilling jobs without overtaxing the operator. Many manufacturers have added safety features to their rear-tine tillers. For example, most tillers have frontside counterweights to help prevent them from flipping over. What’s more, some have protective bumpers that serve to prevent debris from flying up and hitting the operator. A pushdown safety bar, which enables an automatic stop upon release, is also standard in most rear-tine tillers. An adjustable depth stick enables operators to control how deep the tines dig into the soil. You can use this feature to avoid overworking your machinery. Most rear tine tillers are easy to operate, but here are a few things to watch out for if you’re new to mechanical land cultivation. With the tillers located directly under the handle, users feet are often within slashing range of the tillers. Safety panels often guard against any accidental impacts. However, you should always wear protective, tight-fitted shoes and clothing to avoid bodily harm. Never wear loose jewelry or accessories that could be easily entangled in the machinery. Tillers are friendly giants, but they are no joke! If you’ve ever accidentally run over a rock or toy with your lawn mower, you can probably imagine the destruction a rear-tine tiller can cause when obstacles are left in the way. Clear the area you plan to till before turning on your tiller. Remove large stones, toys, sticks, and other debris. This will help you preserve the quality of your tines, keeping them sharp and ready for action for years to come. Most rear-tine tillers are self-propelled, but that doesn’t seem to stop people from trying to force them along. Let your tiller travel at its own speed. This will help ensure that each patch of land is evenly cultivated. Use your gear shift lever to set your direction and speed. Then, adjust your throttle to control the engine’s output. If your machine has an axle lock, you may wish to set it in place to help you better till in a straight line. You will also want to adjust the depth by raising or lowering the depth lever. Before you power up your tiller, be sure to inspect the area you wish to till. Remove any potential obstacles to damaging your machine. Once you’re ready to start tilling, you’ll need to press and/or pull your starter. This will release a small amount of fuel and spark your starter to get your engine purring. After that, you’ll need to push down the safety bar and hold it in place. The tiller should propel forward at a slow speed. There are a few quick and simple things you can do to keep your rear-tine tiller up and running for years to come. First off, be sure to change the oil and fuel filter regularly. Check the oil before and after each tilling session to ensure that it is at the right level and suitable to use. Be sure to also replace the air filter at least once a season. This will help keep dust and debris out of the engine and carburetor. You should also make an effort to thoroughly clean and lubricate the tiller’s tines after each and every use. This will keep them sharp and functional. Be sure to inspect your tiller’s tires regularly. Be sure to replace tires with worn tread or noticeable gashes. Add air to keep them level and performing well. The Southland SRTT196E Rear-Tine Tiller is a fierce gear-driven land cultivator with deep counter-rotating tines and heavy-duty 13-inch pneumatic tires. It has traditional pistol grip handles and the option to go in forward and reverse. With a 2-year warranty and EPA-certification, it is a consumer favorite that’s designed to last for years. The Southland tiller boasts a powerful four-cycle engine that puts out 196cc of horsepower. What’s more, its powerful 11-inch tines provide a maximum tiller width of 18 inches and maximum tilling depth of 10 inches. An integrated depth regulator lever enables users to make accurate adjustments at any time. Yet another amazing rear-tine tiller, the Husqvarna CRT900L Rear-Tine Tiller comes complete with a powerful Briggs & Stratton 900 Series OHV engine. The incredible four-cycle engine whips out enough horsepower to move its brute counter-rotating tines. With an adjustable tilling width that expands to 17 inches, this workhorse is well suited for nearly any job. The Husqvarna can move forward and backward, offering impressive maneuverability at nearly every angle. It even has large pneumatic wheels with plenty of treads to grip those pesky slick patches in the middle of your garden. On top of that, this tiller boasts loads of important safety features, including a counterweight element and foam-covered plow grips. Front counterweight on 13" pneumatic wheels. The YARDMAX YT4565 rear tine tiller utilizes a speedy Briggs and Stratton engine. 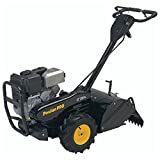 It features an adjustable 18-inch tilling with a 6.5-inch digging depth. The tiller has a whopping 13 self-sharpening tines that work together flawlessly to till nearly any type of soil, including rocky earth and clay. It also has a frontside counterweight and 13-inch pneumatic wheels for optimal balance and support. The entire system is self-propelled. Users can take advantage of the abundance of adjustable controls. The Poulan Pro PPCRT17 Rotating Rear-Tine Tiller’s black and yellow colorway makes it easy to identify off the bat. Its 208 CC of horsepower and counter-rotating tines are what make it such a popular model. The tiller has a standard 17-inch tilling width and 6.5-inch tilling depth. All 231 pounds are set on strapping 16-inch pneumatic tires. The Poulan has 12 13-inch counter tines that serve to grind dense soil into fresh aerated earth. On top of that its chain-driven transmission enables ceaseless tilling in any direction. One of the Poulan’s coolest features is its split-loop handle, which can be raised and lowered depending on a user’s preference. Backed by a generous 2-year warranty, the Poulin offers some of the best tilling on the market. 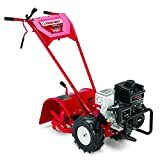 The Troy-Bilt Pony ES 250cc Rear-Tine Tiller features a reliable electric starter paired with a 250cc Briggs & Stratton engine. The Pony boasts an adjustable tilling width of 16 inches and a tilling depth of up to 7 inches. With powerful 12-inch tines, no garden or yard is off limits. The Pony also features 13-inch agricultural tires that can traverse nearly any patch of earth with ease. The tiller comes with a limited lifetime guarantee in case something goes wrong when using the product. 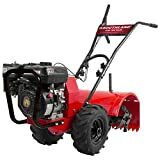 Troy-Bilt’s reputation for quality machinery and top-notch customer service is among the best. With cast-iron gears name patented Bolo tines, the Pony is one of their most desirable creations. We recommend the Southland SRTT196E Rear-Tine Tiller as the best rear tine tiller you can buy for your garden. With the right rear-tine tiller, you no longer need to dread cultivating your yard or garden. The best rear tine tiller is the Southland SRTT196E Rear-Tine Tiller, as it’s durable, ergonomic, and easy-to-use. With counter-rotating tines that can handle everything from clay to rocks, it is a backyard Rockstar you won’t regret buying. The YARDMAX YT4565 Dual Rotating Rear-Tine Tiller is a great option for those on a budget. This workhorse features powerful self-sharpening dual-rotating tines backed by supportive 13-inch pneumatic wheels.